This fun but faithful adaptation of the fantasy football board game offers an abundance of team customisation options, strategic approaches and multiplayer facilities. Blood Bowl has always held a special place in my heart, yet to this day I still cannot fathom why. I’ve always loathed team sports, particularly those involving spherical or elliptical objects, and while the Warhammer fantasy universe appealed to me, my loyalties were always with the futuristic 40K. But by cramming these colourful fantasy elements into a loose depiction of American football, all done with tongue planted firmly in cheek, Games Workshop created something truly special. 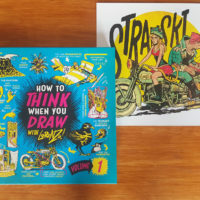 That the board game has remained fundamentally unchanged since its third edition is testament to the solid mechanics behind this novel concept. 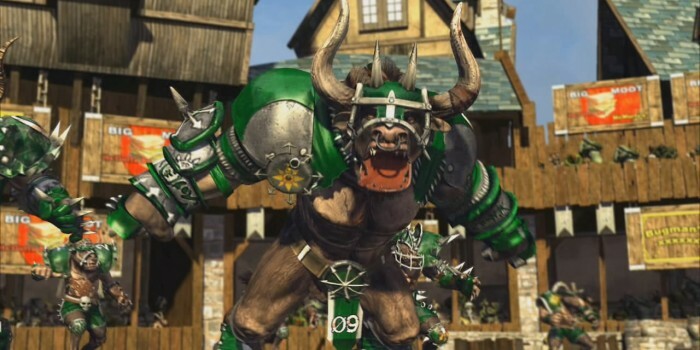 Those who have been awaiting an updated Blood Bowl since the last PC adaptation in 1995 will no doubt have followed the Chaos League fiasco that has ushered this release. To summarise: in 2004 French developer Cyanide released Chaos League, a fine fantasy football game that captured the essence of Blood Bowl a little too closely. 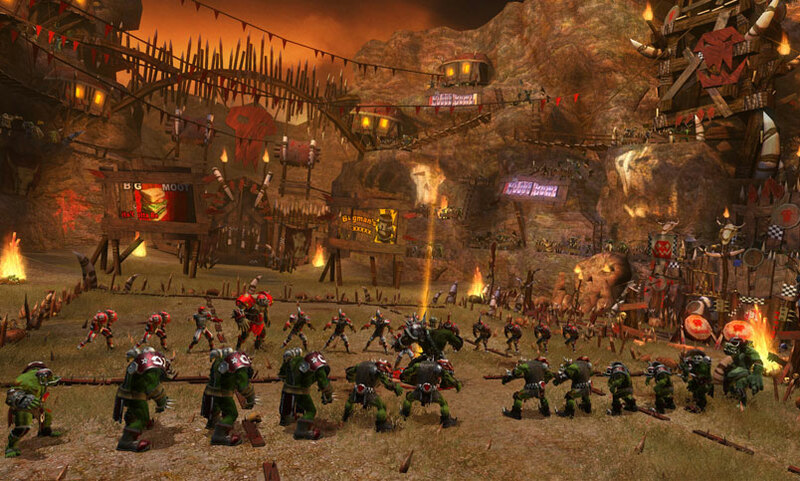 This led to a lawsuit, which ended in an out of court settlement and the startling news that Games Workshop had granted Cyanide the licence to make a new Blood Bowl videogame, provided they adhere to the fifth edition of the game’s Living Rulebook. Cyanide have definitely fulfilled that requirement. In an effort to remain faithful to its board game origins Blood Bowl takes a few paces back from most contemporary turn-based games, making no effort to hide its dice-based mechanics. 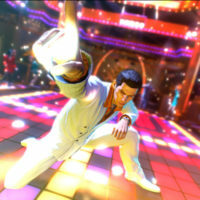 This is a game in which luck plays a heavy part, in everything from picking up and passing the ball to gaining new abilities during level-ups. 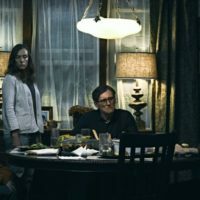 Naturally, those familiar with the board game will welcome this, but gamers tempted by the premise may not initially appreciate that every minor action is decided by the roll of a dice, with luck playing at least a thirty-percent part (at a guess) in your overall strategies. One way to counter this is by buying re-rolls; these escalate in price the more you buy, adding an interesting quandary to the game. Blood Bowl is played by two teams of up to 11 players, with a further five possible substitutes, though there are several distinction between the rules of this sport and regular football. Firstly, you are unable to kick field goals; touchdowns have to be carried. Secondly, it’s perfectly acceptable to bludgeon your foes to death with their own limbs. In fact, the fans expect nothing less. Blood Bowl is a game so corrupt that bribing the referee and doping your players are not only commonplace but written into the rulebook. Pay fans to start a riot and hurl fireballs at the opposition’s best players, or hire an apothecary to allow a re-roll on a fatally wounded player. Like Chaos League, Blood Bowl also features a real-time mode, which provides a far more accessible experience but feels somewhat lacking. While it is fun to see the individual players manoeuvring the pitch with a life of their own, this approach strips the game of much of its depth. Perhaps the major drawback with the real-time mode is that it still requires a working knowledge of the Blood Bowl rulebook to fully appreciate the game’s depths; thus novice players who immediately flock here might understandably dismiss the game as shallow. At the other end of the scale, it is also possible to play the game strictly according to the board game’s Living Rulebook 5.0 ruleset, which strips the turn-based mode of some of the newer features but offers veteran players a chance to essentially play an unaltered version of the original online. The eight selectable teams are surprisingly diverse, and each requires tailored tactics to win. 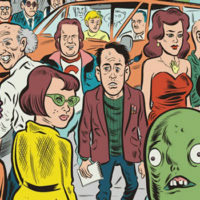 Humans are the all-rounders, with each member allotted a very specific role. Unexpectedly, the Orcs are also pretty versatile, but with a leaning towards full-frontal assaults. Wood Elves and Skaven have incredible movement and agility statistics, but have the tendency to drop dead if another player so much as steps on their toes. 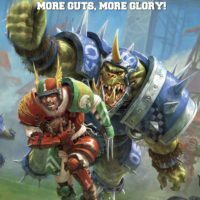 Conversely, the Chaos and Lizardmen teams are focussed on cracking their opponent’s vertebrae, but lack the ball-handling talents of other teams. Dwarf’s little legs cost them considerably in the movement department, but their stout physiques make them near-impenetrable. And finally we’ve the runty Goblins, who may appear the least likely race to be performing blocks and tackles but are quite willing to sneak secret weapons, including chainsaws and pogosticks, into a match. Each team also has the opportunity to buy at least one Big Guy, who as the name might suggest is solely concentrated on dishing out the hurt. While it’s always tempting for new players to opt straight for the Big Guys, they’re size comes at a price – not only are they expensive, but they’re not always particularly useful. The Chaos team’s Minotaur, for example, is likely to win any one-on-one confrontation he enters, but is also just as likely to refuse your directions and do nothing. Even the Dwarves have a Big Guy, in the form of the steam-powered Deathroller; though you might want to reconsider spending the money on this indestructible killing machine when you take into account that it cannot handle the ball and only plays for one period of any game. The more successful team might also wish to hire a star player. These guys aren’t cheap, but you only have to look at their stats and abilities to recognize that they’re often worth every penny. Currently there is only one available star player per race, including the venerable Griff Oberwald and Orc brute Varag Ghoul-Chewer. 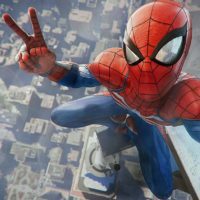 Other teams are reportedly on the way as downloadable content, with the popular choices being the Undead and Dark Elves teams; hopefully they will be joined by more celebrities. Matches can be played in numerous leagues and tournaments, though the most satisfying single player experience can be found in career mode. Here you create your own team, deciding on a colour scheme, custom logo etc., and coach them through an endless series of tournaments, gaining experience and cash as you progress. Your funding is initially limited, and it’ll take more than a few victories to be able to afford an optimised team or hire a star player. 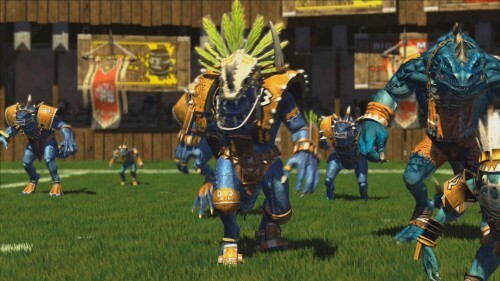 A fictional team game with this fervent but limited a fan base needs good multiplayer facilities, and this is where Blood Bowl really delivers. Cyanide have made a great effort at initialising an online community, with the opportunity to design or join custom tournaments and socialise with other fans made effortless. In addition to LAN play there’s also the Hot Seat mode, in which two players take turns at one computer; for those with an aversion to rolling their own dice, then. 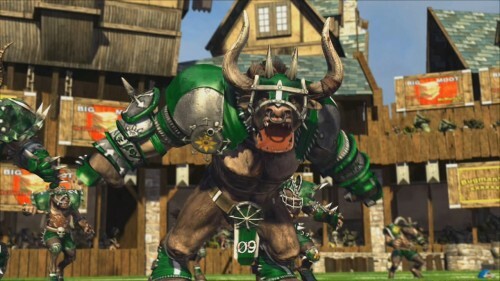 Blood Bowl is a graphically capable game that shines through with some great character designs. From the elaborately decorated star players to the Chaos mutations that grant models two-heads or prehensile tails, Cyanide have captured the attitude of Citadel Miniature’s models perfectly. The flocked bases on your characters during roster selection are but one of many wonderful touches. The humorous commentators from Chaos League also make a spiritual return, and though the witty banter tends to get repetitive several hours in, their anecdotes and snippets of sports history really help to immerse you in the Warhammer realm’s favourite sport. Blood Bowl could easily been a lazy and exploitative use of the license, but by staying true to its board game roots Cyanide have created a sports title that… well, isn’t really a sports title. It definitely doesn’t play like one, and no more than a rudimentary understanding of American football is required to enjoy its rich strategy. The real-time component isn’t likely to hold your attention for long, but this game was always intended to be played in turns. Currently only available in downloadable form, with a boxed PC edition out in September alongside DS, PSP and Xbox 360 versions, the only factor blocking you from buying this game might be the steep £40 price tag. Blood Bowl veterans will value the game’s loyalty to its source, and anyone willing to invest time into learning the complex ruleset will discover a potentially inexhaustible level of depth. 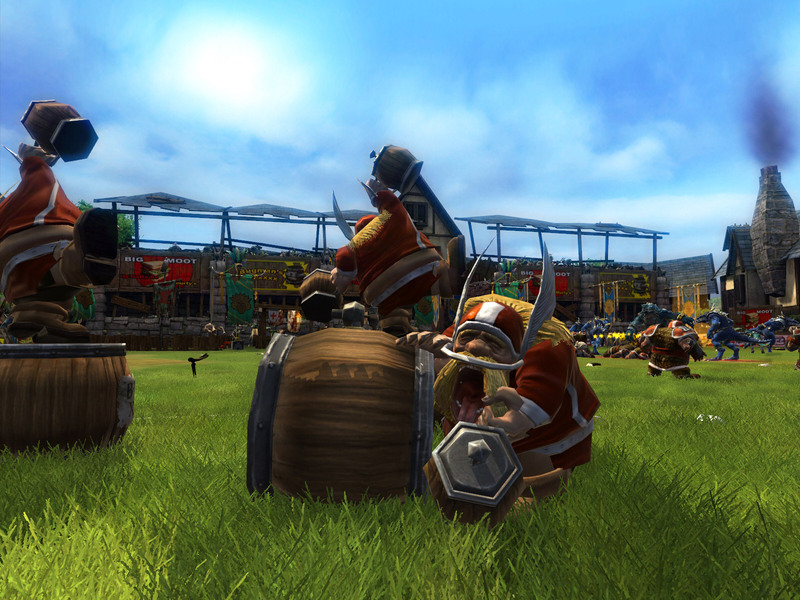 Crucially, Blood Bowl is a game that encourages you to play it your own way. Do you opt for the Goblins, and hack your opponent’s numbers down over the first half, or actually bring an element of ball play onto the field with the nimble Elves? Stock your team out with Big Guys and a Star Player, or a team of standard linemen with multiple dice-rolls and enough spare cash to slip a few backhanders to the ref? In Blood Bowl, anything goes.